Growing up, I lived in a yellow cape cod with white scalloped edging along a pitched roof on Park Street. Stenciled window boxes were bubbling over with flowers and vines, and the grass was always lush, green and inviting. Giant willow, evergreen and maple trees lined front yards and neighbors were often found busying themselves with their homes and families. Our family of 5 shared 1 bathroom amongst us. Relief from the heat in the summertime was only found in 1 room…directly in front of the air-conditioning window unit. We ate our meals in the kitchen amongst strawberry printed wallpaper in colors of yellow, red and white from floor to ceiling. The octagon shaped table was white with yellow trimming the sides and yellow chairs that the back of our legs stuck to when wearing shorts. (If you hadn’t moved from one position longer than 5 minutes, it was inevitable we would be “peeling” ourselves from them.) I loved it. I loved everything about that kitchen, our house, our neighborhood, our simple little life. But I was a kid; a kid who had nothing more to worry about than our parents calling us inside from a days worth of playing outside. 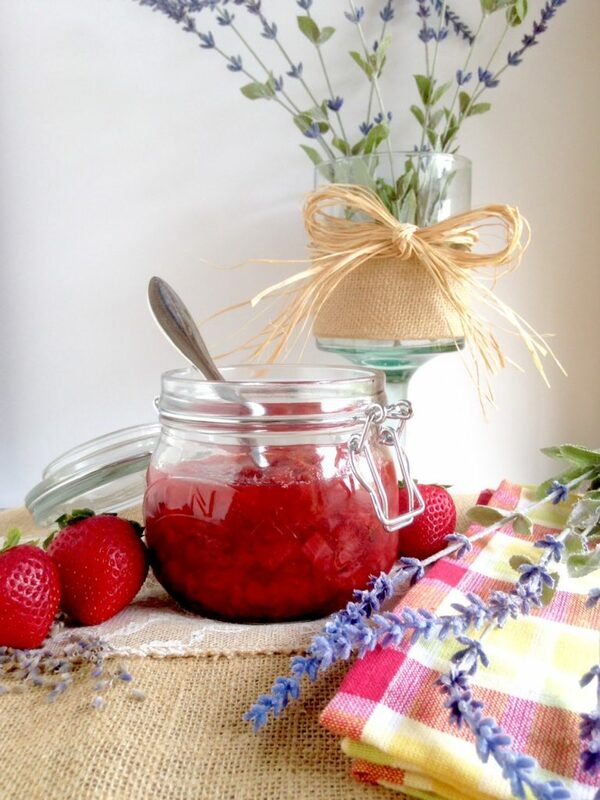 Strawberry Lavender Jam is the epitome of summertime. Strawberry season is upon us and in full force. 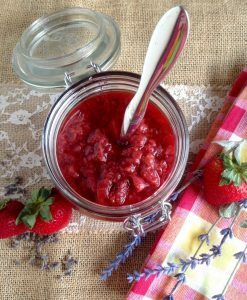 The simplicity of flavors and seasonal freshness achieved with my Strawberry Lavender Jam truly reminds me of my childhood and the house that I grew up in. I have fond Christmas-time memories, but the moments that stand out the most were often this time of year. My siblings and I would eat our lunches in that kitschy, strawberry covered kitchen, telling jokes and laughing, while stealing potato chips off of my brothers plate. And there were those times we’d be forced to sit for hours in front of a plate of cold brussel sprouts amongst the loveliness and cheeriness of the strawberry décor. The days events were shared with each other at dinnertime in that kitchen along with the game, “let’s see who can make the ugliest face”. This recipe for Strawberry Lavender Jam was inspired by that strawberry-covered kitchen growing up. Those memories loom in front of me this time of year…memories surrounded by “strawberry fields forever”. In a medium saucepan, add strawberries and sugar. Turn heat on medium heat and stir. Cook down for 5 min while stirring occasionally. Reduce for another 10 min, continuing to stir occasionally. Turn heat to low and keep mixture at a simmer. Add remaining ingredients and reduce for another 10 min, stirring occasionally. Remove from heat and allow to cool for about 20 min. Jam will keep up to 2 weeks. Or freeze in the freezer for up to 6 months. Get your Sweet & Salty Surrender here! Take advantage of the season. 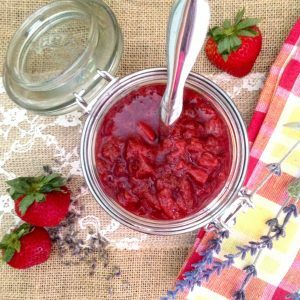 Stock up and enjoy berry season all year long by making a bunch of this delicious Strawberry Lavender Jam and freeze. (Be sure to choose only organic strawberries as they tend to be one of the most heavily sprayed with herbicides and pesticides.) 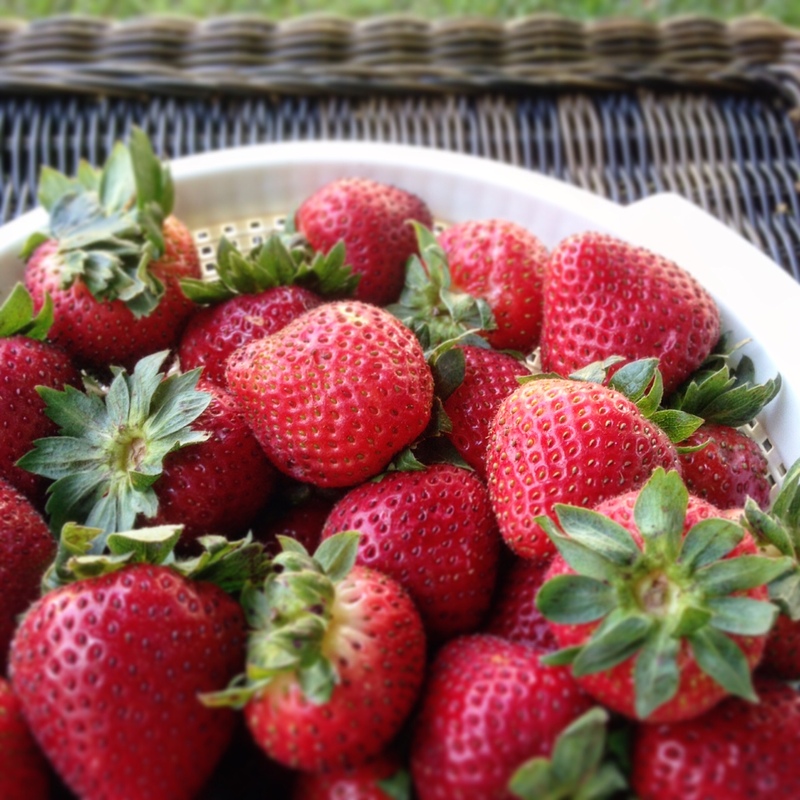 Visit your local farmers market, or take the family strawberry picking at a local farm!